Welcome to the University Women's Association! The University Women's Association (UWA) seeks to stimulate, cultivate, and encourage a friendly community spirit at San Francisco State University (SFSU). We welcome all current and retired university women to participate in our events and encourage them to join our organization. The UWA has been bringing together members of the campus community since 1946. Membership is open to women faculty, staff, and administrators and/or their spouses and partners. All other individuals who support our mission, including men, are invited to join as "Friends of the UWA." Click here for our current newsletter (August 2018) or view a list of past issues. For accessibility assistance with this document, please email Connie Tallerico at ctalle@sfsu.edu or call (415) 338-3888. Download Adobe Acrobat Reader. Download free Microsoft Word Viewer. View/download the flyer for the Tour — Global Museum on Thursday, October 25. View/download the flyer for the SPRING SCHOLARSHIP LUNCHEON — Tuesday, May 1. Each year we organize and sponsor a wide variety of on-campus and off-campus events to bring members of the campus community together in stimulating and enjoyable settings. We raise funds for the Gloria Spencer University Women's Association Scholarship Endowment Fund. The UWA typically awards four or more scholarships each year, between $1,200 and $1,500 apiece. Scholarship recipients are determined by an evaluation committee and are based on a student's academic scholarship and financial need. Deadlines and requirements for applications may be found on the Office of Student Financial Aid website. Our most successful fundraising events are the UWA scholarship cruises; we have sponsored 20 cruises to date. While touring exotic and historic ports around the world we generate thousands of dollars for scholarships. We provide volunteers and host the reception for the annual Undergraduate Honors Convocation, recognizing the university’s most accomplished graduating seniors. 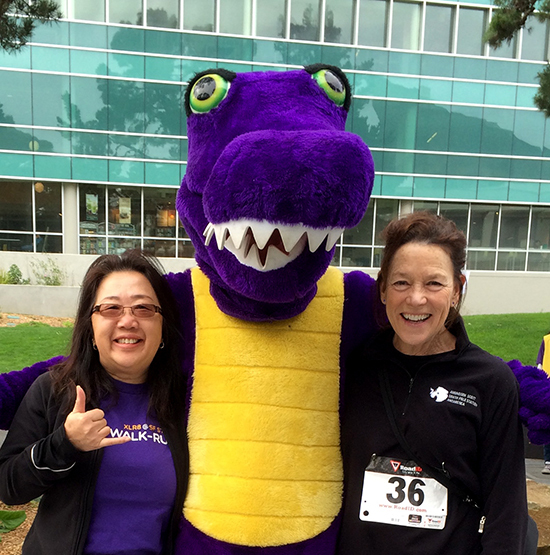 Co-Presidents Lily Gee and Jeanne Mangerich with SF State's Gator mascot. We are pleased to be able to fill in as Acting Co-Presidents of the UWA while Bérénice Le Marchand is on leave from the Board. She has been President since 2007, and we are happy to be able to give her a break and to provide leadership for this organization in her absence. The UWA serves the campus community by providing a wide array of activities to bring together faculty and staff, current and retired. The University Women’s Association is one of the oldest organizations at San Francisco State University, serving not only the campus but also the community since 1946. Activities have included lectures, innovative gatherings such as book and panel discussions, on- and off-campus theater events, city tours, docent-led museum tours, dinners and teas. The UWA offers an interesting mix of monthly activities during the academic year, as well as some traditional annual events like the Holiday Luncheon in December and the newer Spring Luncheon where we honor recent scholarship recipients. We provide volunteers for the Honors Convocation each year and host the reception following the ceremony. And, most importantly, we raise money for scholarships thanks to numerous scholarship cruises and generous donations from our members. In recent years we have been pleased to award five scholarships each year to promising SFSU students in need of financial assistance. We would like to take this opportunity to express our gratitude to the executive board members: Annie Antler, Lin Ivory, Bérénice Le Marchand, Donna Ryan, Connie Tallerico, Ilona Vandergriff, and Arline Van Ness. It has been — and continues to be — an insightful and productive collaboration. A special “Thank You” to all of our members for their continued support over the years, both through their memberships and active participation in our activities. We are a volunteer organization, with no funding from the campus or state; we rely on our members’ support and dues. If you are not yet a member, please consider joining us by using the membership form found on this website. Members receive newsletters and advance announcements of all our events. Hope to see you soon at some of our upcoming activities.